Tesseract have released an online documentary showcasing their run of European summer festival appearances this year. The 20-minute film follows the band as they play across mainland Europe and it also features their appearance at the UK’s Download festival in June. Speaking about the experience, frontman Daniel Tompkins says: “I live quite close to the Download festival at Donington, and I’ve always gone and watched all my biggest inspirations on those stages. Tompkins split from the band in 2011 and was brought back into the fold in 2014, replacing Ashe O’Hara prior to work on the band’s third album Polaris, which launched last year. And the vocalist reports he can see the band’s progression due to the fact they’re now playing to larger audiences. He continues: “It’s the first time we’ve been on a big festival run. We’ve done quite well this year – we’ve had some good billings and played some big stages. The crowds have been incredible as well. I really do think that’s a good sign of the progression of the whole band. Tesseract will release the tour version of Polaris on September 16. The package includes bonus disc Errai, with four new songs Survival, Cages, Tourniquet and Seven Names. They’ll head out on tour next month and will support the Devin Townsend Project on their UK run in 2017. 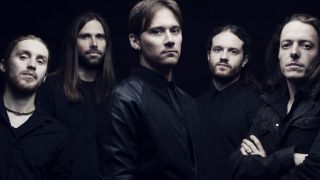 For more on Tesseract check out TeamRock’s new artist directory, featuring other news, features, reviews, biography, tour dates, tracks and more.